A customer lives in a high-rise condo. How do you deliver to a specific condo? A customer has been receiving products at work because someone is always in the accept. how do you deliver to a high-rise office. Just how many of these things will we need. Right now a delivery truck can easily take care of 200 customers during a day. Trucks are loaded at night and drivers roll in the early morning deploying as the urban traffic patterns allow. Consumer deliveries at night are not feasible. Half hour delivery or its free is tough. Just ask any pizza operator. Or watch a pizza delivery guy in traffic ahead of you. It’s dangerous. What about urban guerilla warfare. How many geeks and techs will hack the airwaves and pirate the shipments. If the mob can high-jack a tractor-trailer of goods the mob will learn how to high jack drones. Not to mention bored but brilliant teenagers who will just try to shoot them down. I’m putting my money on Google with its driver-less cars. Add in some Tesla green tech and you have trucks that can deliver. The drones will be robots that can bring from truck to doorway. Oh and there’s always the terrorists who will deliver a small but lethal package right to the Whitehouse and god only knows where else. Free shipping it beats high jacking jumbo jets and all that airport security stuff. If you thought Apple Inc, Samsung and Google had global patent lawsuits going FedEx, UPS and DHL will not sit back and let Amazon take this one over. FedEx (NYSE:FDX) reported Q4 results. A big part of their story is fleet replacement. Old aircraft and engines are being retired. New more efficient gear is coming on board. OK makes sense. At the same time the company mentions labour costs are still high and pension costs are substantial. Part if the reasoning is low discount rates which balloon up unfunded pension obligations. Not really a new piece of news. Anyone with a pension plan knows this argument inside out. FedEx puts it out there again. The question becomes have they maxed out on employee efficiency. A driver can only carry so many parcels and make so many deliveries in a day. If they are noticing employee costs to the point where they comment about it in disclosure there needs to be cause for concern. During the conference call the analysts did not really do a good job covering the point. Not really the best approach to Reg FD. The chairman is now on record dodging a major issue. Clarity, visibility, transparency are all fails. Surprising for a company like FedEx but here you go anyway. FedEx created itself on the basis of air freighting everything. The fleet upgrade will have strategic impact over the next seven to ten years before the equipment starts an obsolescene decline and needs a new equipment cycle. Investors need to understand the aircraft strategy to understand FedEx. US Post Office in big financial trouble. They skipped pension contributions, they are laying off and forcing retirement for some 200K and they may still miss the payroll in a few months. This just confirms Standard & Poors credit downgrade to AA+. Governments with a AAA rating do not allow problems to go on for so long. Wonder who else will needs to resort to blackmail and games of chicken to protect their funding. 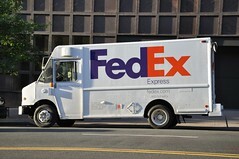 In the meantime FedEx (NYSE:FDX) and UPS (NYSE:UPS) eat Uncle Sam’s lunch with lower labour costs. Disclosure: George Gutowski writes from a caveat emptor perspective. I hold no positions in stocks mentioned in this post. I have no plans to initiate new positions within the next 72 hours.